Maybe six points aren't all that important. Could there be a change in the ranking order? Guess who was running plays with the first team offense today? Give Up? Jed Collins, #48, of course. The name not ringing a bell with you? That's OK, our opinion isn't the one that counts anyway. What does matter is the opinion of one Mr. Andy Reid. "He did a nice job in the limited plays he had offensively and also on special teams. That fullback position you gotta produce on special teams or you're gonna struggle to make it there. He[Collins] did the best job." 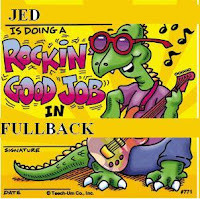 Way to go Jed. Collins was signed by the Eagles as an undrafted free agent in 2008 after playing his college football for Washington State. Oddly enough Collins was a TE in college. During his senior year Collins caught 52 balls for 512 yards and 3 scores. Based on Reid's comments it seems like his transition to FB is going quite well. If anything his size, 6'2" and 250 lbs, makes him in opposing figure in the backfield. So the mystery of the Eagles starting fullback continues. One thing that looks pretty obvious is that Luke Lawton's time with the Eagles could be very brief. Stay tuned as I am sure tomorrow will bring another twist. Whoever would of thought that replacing Thomas Tapeh would prove so difficult. Oh yea, in other news Shawn Andrews has finally reported to Lehigh this afternoon. A good old pow wow with Reid is the next step for Andrews. Oh, what a lucky guy! But come on, isn't Collins the bigger story?